Now we are having fun! 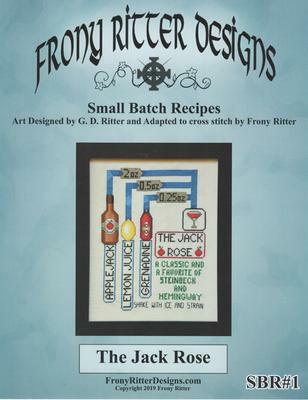 Here is the first in a limited edition, Small Batch Recipe pattern. First we are going to have stitched, illustrated drinks, and then we will move on to the ever fun, cookies. It's time to stitch eggs for Easter. These won't go bad, and you can use them year after year. There are five in the Spring Series and you can count of more designs in future years to add to your collection. Here are some new minis, ready just in time for summer. In addition, there is a extra pattern on the back of the chart. Also new isthe third in what we refer to here as the "bug series", which is really another addition to the Summer Series. Glistening Butterfly joins Glowing Firefly and Shimmering Dragonfly to complete the set. 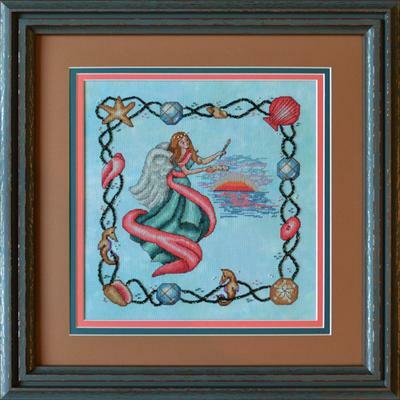 Here is a new chart, which is exclusively available through the Nashville Needlework show until April 6. Here is the newest of the Ornament Series. They are business card sized patterns that can be stitched quickly for a gift. This love note, though can be treasured for a lifetime. The patterns only retails for $2, which is less than half the price of a cup of coffee at some coffee shops. 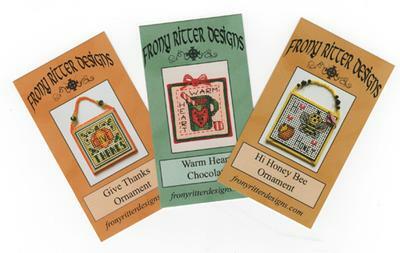 A second new business card sized pattern can be stitched as either a tag or an ornament. 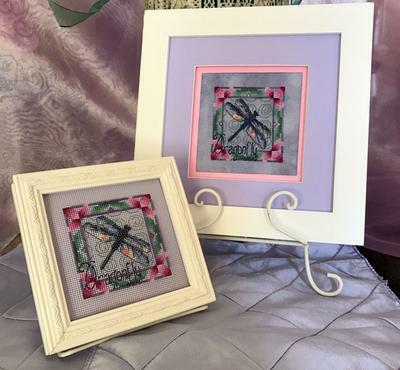 Here is another pattern that will be available through stores that attend the Nashville Needlework show, and will be available everywhere after April 6. The starburst uses Mill Hill beads, which make it sparkle along with the angel wings and star glow, thanks to Kreinik blending filament added to the thread. Sweet Mrs. Santa has joined the Christmas Crew. She can either be stitched or stitched and beaded. The gumdrops glisten with sparkly blending filament. Mrs. Santa has beads and sparkles on her hat. The newest mini pattern is Old Glory, which can be stitched on either fabric or perforated paper. We have released this new chart as the fifth in the Fall Series. It is stitched on three different fabrics, to show how different it can look on different backgrounds. It is available now. Here is our first design in a large format, although you can take elements from the big design and put them onto towels, or smaller items. This design is a little more challenging as it has half stitches, and uses chenille as the seaweed. The colors are so fun, I stitched the piece twice, once on 14 ct. aida and once on 28 ct. Jobelan. As Celtic Art is our first love, we are always working on Celtic pieces and here is our latest design, Celtic Diamonds. It can be created with either just stitching or a combination of stitching and beading. Here is a companion piece to the Shimmering Dragonfly, which we released last spring. It is part of the Summer Series. This piece is fun because the tail and the glow around the tail glows in the dark, thanks to Kreinik glow in the dark blending filament. 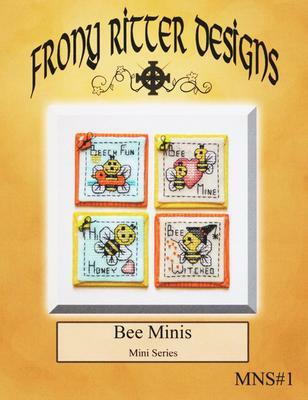 It's time now to stitch for summer, four small bees to stitch, perfect for making into ornaments to put on a "bee tree". 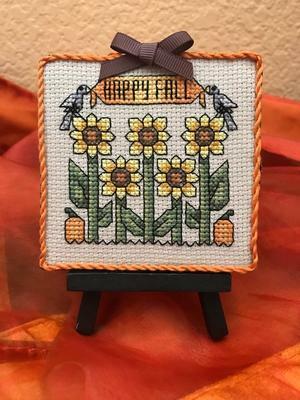 The Hi Honey Bee design comes on a business card size so it is perfect to tuck into a tiny space for any emergency stitching (being stuck in traffic, at the doctor's office, waiting in line at the DMV). Because we have heard from many of you that you like the little projects, and because that is our favorite also, we have put out some more minis, small enough to fit in the tiniest pouch or purse. Also, check out other parts of the website. There are ideas for cards, tags, boxes, bags and other papercrafting. Included are ideas, using stamps and products from various companies. This is how the website began, as just an idea place. Here is the fifth in our Summer Series. 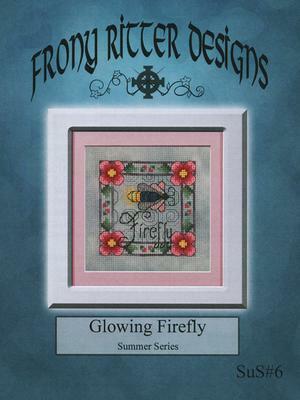 It features sparkly Kreinik blending filament and Sulky Holographic Shimmer thread to make the dragonfly look as shimmery as it looks in real life. 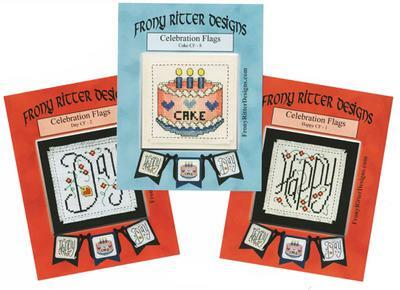 Frony Ritter Designs celebrates with flags. Check out our new category on the left, which is Flags. You can stitch and display flags to celebrate every occasion. You can change the colors, add buttons and bows to fit your personality or the occasion. Check back frequently as we will be adding more soon. And don't forget the second booklet of Twenty Minis. This booklet covers the Thanksgiving and Christmas holiday, and are quick but interesting ornaments to stitch. They can be made into cards, tags, ornaments, jewelry, magnets and more. They can be stitched on fabric or on perforated paper. We have released our first booklet, Twenty Minis. 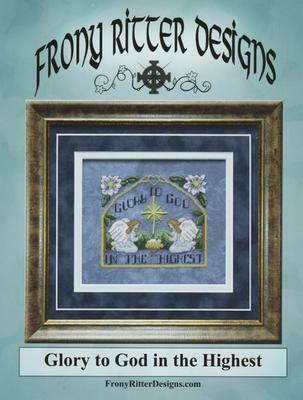 You can get your copy of four each of baby, wedding, Easter, garden and Celtic motifs. We have seven designs in our Christmas Series. Five of them are snowflakes. 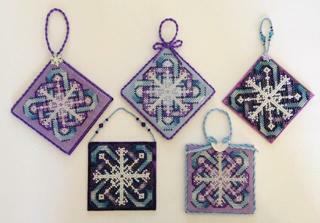 Stitch all five and have your own flurry of Celtic Snowflakes. There are four wine charm kits available. They can be made as wine glass or wine bottle charms, ornaments, framed or made into tiny tags, cards or jewelry. 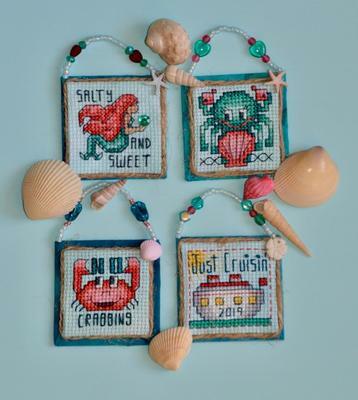 They can also be stitched with a combination of beads and cross stitch. 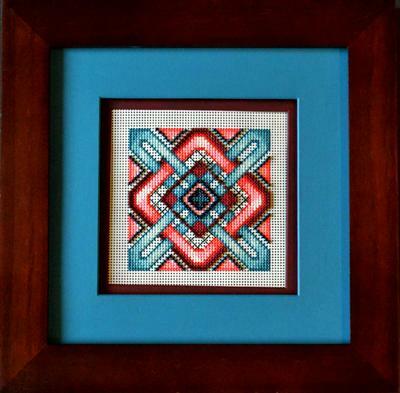 Check out possibilities on the Cross stitch charts. The kits include everything you need to make these charms, except for glue and scissors. They are fast and simple to make. 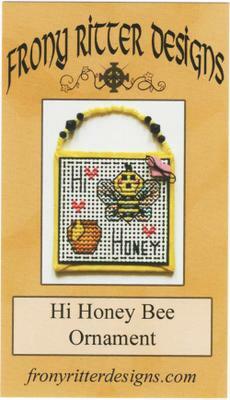 They are great kits for beginners to learn to stitch. The colors can be changed to suit your decorating tastes. They also make good favors for parties, or for the ambitious stitcher, for weddings. Check out our first 8 in the Celtic Series Patterns, each with instructions both for counted cross stitch and with instructions for a combination of cross stitch and beading.If room allows, each chart contains a Wee Bit of History about the general motif in Celtic History, enough hopefully to interest and not bore you. 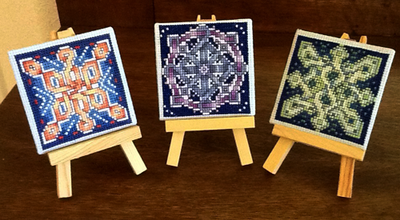 Also are free beading, painting and cross stitch patterns. Check back frequently as we will add more.